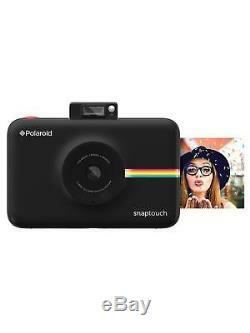 Polaroid Snap Touch Instant Print Digital Camera with LCD Display - Black. Cameras > Cameras > Instant cameras. Top features: - Instantly print and share straight from the camera - High resolution images stored on the microSD card - Creative modes for adding filters to your photos - Large 3.5 touchscreen for easy photos and playback Instantly print and share The best of both worlds, the Polaroid Snap Touch Digital Instant Camera lets you capture digital photos and print them straight from the camera. You can print 2 x 3 (50.8 x 76.2 mm) on Polaroid's Zink Zero Ink Paper great for creating memories to treasure or giving to friends and family. High resolution images The Snap Touch captures 13 megapixel images and Full HD video, all stored on the microSD card for easy access transfer and backup to your PC, or instantly share with your iOS or Android smartphone via Bluetooth. Creative modes The Printing app lets you edit and add filters, text, borders, emojis, digital stickers, and more it's a great way to add personalisation and fun touches to your photos. Large 3.5" touchscreen The large 3.5" touchscreen makes it simple to navigate menus, print photos, compose shots, and playback images and videos. All Currys/PC World Outlet guarantees are non-transferable. Sensor type: 1/3.2 / 4.54 x 3.42 mm CMOS sensor. 3.5 / 88.9 mm LCD touchscreen. Camera type: Instant digital camera. Size: 1/3.2 / 4.54 x 3.42 mm. Focal length: 25.8 mm. Screen: 3.5 / 88.9 mm LCD touchscreen. Screen features: Adjustable brightness and contrast. Photo effects: Normal, Black & white, Vintage/sepia. Video mode: Yes, with sound. Maximum video resolution: Full HD 1920 x 1080p (30 fps). Other video resolutions: HD 1280 x 720p (60 fps). Video file formats: MPEG 4. Memory card: microSD, microSDHC, microSDXC. Number of memory card slots: microSD x 1. Pictbridge / direct printing: Yes. App available: Polaroid Print app. Other features: Prints 50.8 x 76.2 mm (2 x 3) photos. Box contents: Polaroid Snap Touch Instant Digital Camera, Micro USB cable, Hand strap, Manual, Sheets x 10. Dimensions: 75 x 120 x 25 mm (H x W x D). This product has no reviews yet, however see what our buyers say about our other products.. Small box electricals like computers, tablets, camera's, small kitchen appliances. We deliver within the UK only. We don't post to Channel Islands or Internationally. Warehouse/store pick-ups are not available. For more information, read on.. Courier selection is standard and will depend upon value and/or weight/dimensions of the product. Express: DPD - for safe, secure, signed-for deliveries to your door. This includes Northern Ireland and the Isle of Man. We do not accept orders to PO Box addresses and International orders, including those from the Republic of Ireland, the Scottish Highlands and the Channel Islands. Orders for large domestic appliances are accepted to all mainland UK addresses (including Northern Ireland) and the following islands: Isle of Skye, Isle of Sheppey, Anglesey, the Isle of Wight, and the Isle of Man. This excludes the Channel Islands and BFPO. To create your return label. Unopened - in an as new condition - unused, without installation or data input - in the same condition as supplied to you - complete with any accessories and free gifts offered with it - with the original box and unopened packaging. Unwanted products cannot be accepted after 30 days if any of the above criteria are not met. The right of cancellation does not apply in the following circumstances. When the product seal has been broken on any DVDs, CDs, memory cards or software, including games - On any personal hygiene products such as shavers, hair care products - On headphones, where the seal on the packaging is broken - If you want to return a Software Product Activation Key card which is not faulty, the silver strip on the back of the card must be fully intact as new. Complete the Reason for Return note that came with your parcel & include it in the parcel with your return. Take your parcel into any Post Office. To find your nearest Post Office. Remember to ask for a proof of return receipt from your Post Office as this will act as proof of posting should the parcel go astray. Failure to obtain this may prevent us from refunding you if your return is not received by us. Your return can be tracked using the tracking reference from your proof of return receipt by clicking Track My Return. In the same condition as supplied to you - complete with any accessories and free gifts offered with it - if possible, with the original box and packaging. The above warranties do not cover non-faulty products, nor issues caused by accident, neglect, misuse or normal wear and tear. Please note - we do not stock spare parts, and are unable to send replacement parts. You received an incorrect item - you received a damaged item - you received a faulty item. Can a Currys or PC World retail store help? Reassuring 12 month guarantee on all products. 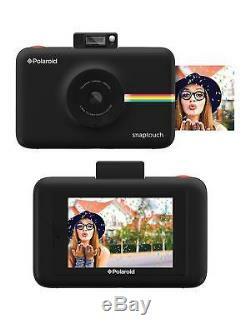 The item "Polaroid Snap Touch Instant Print Digital Camera with LCD Display Black" is in sale since Tuesday, August 29, 2017. This item is in the category "Cameras & Photography\Digital Cameras". The seller is "currys_pcworld" and is located in Newark.